A plane holding refugees from Eritrea has left Italy, part of a plan to help countries hard hit by the migrant crisis. One Italian leader has called the move an important next step in changing Europe's migration policy. The plane, carrying 19 refugees from the troubled African nation, left Rome's Ciampino airport for Sweden on Friday, the first phase of the European Union's new resettlement program meant to alleviate the burden faced by countries overwhelmed by the influx of migrants. The plane was bound for Kallax airport in the north of Sweden. 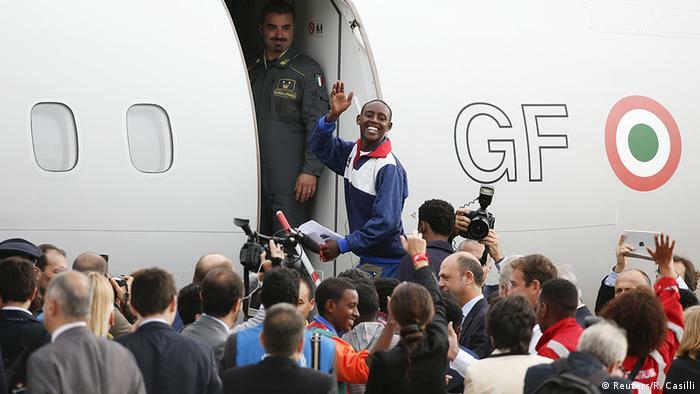 The young Eritreans' departure was also designed as something of a spectacle for the press, with Italian Interior Minister Angelino Alfano making an appearance and shaking the refugees' hands before the cameras. He told reporters this served as proof the EU was altering its migrant policy. He said flights to Germany, the Netherlands and other countries would begin in the coming weeks. The EU announced plans to redistribute refugees in September, with plans to relocate around 160,000 people within the next two years. The EU's migration commisioner, Dimitris Avramopoulos, called for all member states to show solidarity in the face of the crisis. EU leaders have faced a historic challenge with the rising number of refugees arriving from impoverished and war-torn countries in the Middle East, Africa and elsewhere. Economically weaker eurozone countries in the south, such as Greece and Italy, face particular strains. It is true that we must listen the interviews of the presidents and those who are on the higher posts to learn about pay for papers that what they did and how they struggled to reach on that point in their lives and I am sure that they got some help from as well. Refugees are always need good places to spend their days and they have no money or other important Essay Writing Service so the governments and other world countries should help them. They face a lot of problems because of the some odd reasons. The refugees have to face many difficulties. They have to survive their own motivation besttermpaper.com and through self-help. Sometime the refugees become unmanageable for the government due to limited resources of the government. Handling this difficult situation is a great challenge.